If you woke up in the middle of the night and smelled smoke from a fire, would you know what to do? Planning for disasters is never pleasant, but it’s important to know how to make a fire escape plan for your house to ensure your family’s safety. Even if you have smoke alarms and escape ladders, you still need to have a sound strategy for getting all of your family members out safely. It won’t take long to do, and the payoff will go a long way toward keeping your whole family safe. Once you determine your safety plan, you will sleep more soundly at night, knowing you’re ready for any disaster that comes your way. The most important thing is to first establish that your current fire safety protocols are working properly, and if not, to get them up to speed. Working smoke alarms cut the risk of death from home fire in half. Check and/or replace the batteries on your smoke detectors. 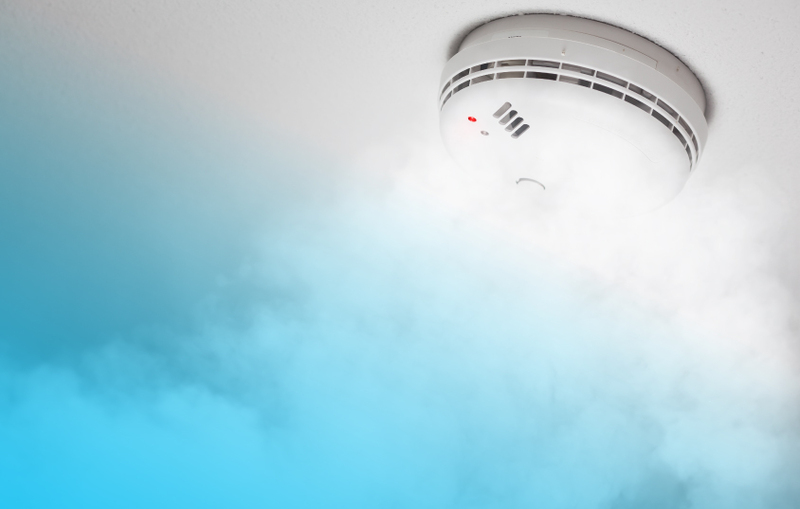 If you’re not sure about how reliable your smoke detector is, check out Mesa Alarm’s extensive selection of fire safety items, including smoke detectors, heat detectors, and fire alarm control panels. Knowing you have equipment that you can trust goes a long way in giving you peace of mind. Also, make sure that each area of your home is sufficiently covered for smoke detection. Check your model to learn your smoke detector’s range, and then space them accordingly so your home doesn’t have any blind spots without coverage. Once you know that your home is equipped to warn you of impending fire danger, it’s time to put a plan in place in case of emergency. This begins with understanding the layout of your home and where each family member will be located. The American Red Cross offers a useful home fire escape plan printable to use for your own planning. Diagram it out and draw arrows so the routes are clear for everyone. Once you have the layout established, you can start on the finer details of your evacuation plan. Identify the escape routes for all areas of the home. Ideally, every room or area should have at least two ways to escape so that everyone has an alternative should one area be inaccessible. All upstairs areas will need escape ladders to be stored in an easily accessible place. This is important when considering children—make sure you store ladders in an area kids can reach in case you can’t get to the room to help them. Teach children the importance of getting out of the home safely—getting belongings isn’t what matters. Ideally, the first escape route won’t involve climbing out the window, but it’s important to be prepared regardless. Once everyone knows how they will escape each room, decide on a meeting place outside. Pick a spot that is a safe distance away from the house, but not so far away to make it difficult to account for everyone quickly. From this spot, you can call the fire department once everyone is safely outside. Your fire escape plan doesn’t end with just making it. You must put it into practice and do fire drills until everyone in the home can get out in less than two minutes. This is a crucial step; make sure you use a timer to check. Many believe that you have as many as five to ten minutes to get out of a burning home, but this is simply not the case. Practice your escape plan every six months to ensure no one forgets or to make adjustments if circumstances in your home change. Test out windows to make sure everyone can open them if they need to. Designate adults or older children to help younger children, the elderly, and those with mobility limitations. Make sure that everyone knows what their role will be, should a fire break out. It’s important to make your practice as realistic as possible, so try waking up to smoke alarms to train your brain that the noise means to get up and get out. Practice low crawling to avoid smoke in the event of an actual fire; don’t just talk about how you will do that if it happens. Do “stop, drop, and roll” drills to be used in case of clothing catching on fire. The National Fire Protection Association reports that half of home fire deaths occur when the fire is between 11pm and 7am. This is why it is vitally important to plan in advance, as you won’t have time to think about it in the middle of the night. On average, seven people in the U.S. die from home fires every day. Fire can happen to anyone, anytime. The American Red Cross developed a Home Fire Campaign after conducting research and realizing that less than 1 in 5 families with children have practiced fire drills, and less than half of families have talked to their children about fire safety. Awareness is key—consider printing this free escape planning tips sheet for everyone in your family so they will never forget what to do in an emergency. Remember to keep calm if an emergency should arise and follow the plan you have established for the best chance of success.